I looked at the group around me, and as the only senior, I felt a little bit uncomfortable. I was surrounded by young people who have spent their time killing people on the internet, but as my kids have taught me that it did not stop them from being successful at studies. The head of the clinic rode on the robot being installed, while two young surgeons (and geeks) handled the joysticks like I handle a scalpel. Will this generational exchange benefit all of us? Only time will tell. However, the senior folks will still have to be in leadership roles. During the internship, I discovered parallel skills, and in particular, the wording and formulation of instructions through the art of debriefing, and analysis of incidents and crash. In the introduction, Jacques Huber presented the diploma of robotics and the need for expert training in this demanding technology, history, Genesis, creation of the certification after 6 days of immersion, and then adaptation by shorter thirds modules, more adapted to the rhythm of surgeons, and concluded with the delivery of the robotic diploma for one-third of the module. “The brain learns through the TEST-ERROR-CORRECTION cycle”. The 80’s dogma of the daily loss of neurons has since been canceled and replaced by the concept of NEUROPLASTICITY OF BRAIN. Any new learning remains possible and at any time. 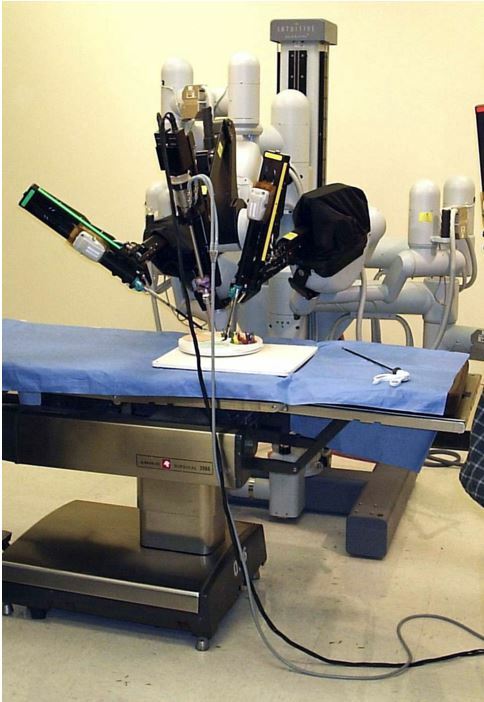 We refer to recent jurisprudence of robotic surgery, rather positional aftereffect due to the length of an intervention (around 7 h 00) without verification of the state of the patient during the procedure. In the presentation by Jean Luc Moreau, it was indicated that your first time can never be on a patient. The learning has to be by simulation as described by HAS 2012. It was, therefore, necessary to perform surgery virtually by practicing with MIMIC and DV trainer simulators, and then practicing on animal or corpses, before working with the patient. Be careful not to pinch your fingers. 100 kgs of pressure between each arm, “we usually remember … “. “He must …” touch the patient, Jean Pierre showed the sterile field of the arms, described the approach and the positioning of the robot by aeronautical indications. “Your turn!”. Finally, he passed us the leash of the beast. The robot was ready to go to simulators and consoles. Two by two, each of us was using the joystick. MIMIC simulators allowed us virtual exercises. The DV trainer simulator had the immense advantage of coupling the robot console with a laparoscopic trainer and of working with a total of four hands, two of the operator, and two of the helper. Nicolas Huber came to supervise … “You should … do it like this … I had this type of problem once … it reminds me of this situation” … rich in scripts and anecdotes that lock the memory. The virtual simulation exercises were sanctioned by the implacable evaluations of the computer and the trainers only allowed you to proceed to the next exercise if you succeeded in the current exercise by obtaining 85% two consecutive times. We manipulated real objects and we did real sutures, we did not have to steal the plastic hoses and break the sutures. “And for the feedback of force?”; “Not necessary” replied Jacques Huber, “obviously micro-surgeons who worked with a wire with a thickness of 10 have already understood this point… It is easy to feel the resistance of a cloth or a wire”. The training was good and progress was rapid. It seems easy but what will it stay 4 weeks later? It will be necessary to recover quickly and validate the rest of the module. and practice, practice …. Anyway, we definitively enter a new era for medical and surgical activities where the cobotic will drive the new technics.